New Cutlet Recipes Coming Soon! Porcini Dijon and Pimenton Masa De Maiz are two, new cutlet flavors we’ve recently put together for some of our customers requests. Soon they will be available to you…that is if you work in food service as we don’t make retail packs of our hand breaded cutlets….that would be way too much work, not to mention the need for a conveyor par-fryer. We’ve been making cutlets for just about as long as we’ve been making Field Roast. Our customers are deli’s, restaurants and colleges. 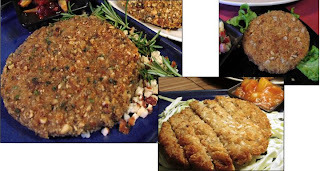 They are a “different” kind of veggie patty, more multi-dimensional and textural…more like the classic chicken fried steak or chick patty style thing. Hand breaded using our own breadcrumbs and a combination of different nuts, seeds, coconuts etc for flavor. They gotta be fried…can’t get around that….but when they are…..that could be heaven! Porcini Dijon….a breaded cutlet of wild mushroom porcini grain meat, dipped in a Dijon mustard infused batter and breaded with house special and chunks of fresh mushrooms…! Thanks to Field Roast Chef Steve Holtz for this one! Pimenton Masa De Maiz…now that IS a mouthful. Lets start with a pimenton (smoked paprika) spicy cutlet of grain meat (chipotle, arbol peppers, etc) and breaded with a combo of traditional bread crumbs, a chunky corn masa (the corn flour used to make corn tortillas), red bell peppers and chunks of fresh corn. Wow….try it with some salsa and sprinkle of fresh chopped cilantro. This entry is filed under Field Roast and tagged chicken fried steak, cutlet, pimenton, porcini.